Most homeowners don’t know what an “ice dam” is – until they experience one . . . and then it’s too late! An “Ice Dam” is a thick band of ice that forms when water from melting snow freezes into ice at the edge of a home’s roofline. The ice that develops may grow large enough to prevent melting snow from properly draining off the roof – causing it to back up underneath the roof’s shingles and allowing it to seep into your home’s walls, ceilings or chimney. We have seen hundreds of homeowners in Wayne, Oakland & Macomb County experience Ice Dam Water Damage to their homes. Sadly, most of these cases could have been prevented with a little maintenance in the fall, before the cold weather arrives! Our professional restoration team understands how and where ice dams form – and exactly what needs to be done to prevent ice dam formation – and to repair the damage if it occurs. Inspect your home for areas where ice dams commonly form. Repair any openings where ice can accumulate, and be certain to clean all gutters and eaves troughs before the cold weather sets in. Once the snow arrives, inspect your roof regularly for areas of accumulation and have ice dams professionally removed before they lead to leaking and structural damage. Do NOT attempt to get on a roof and remove ice dams yourself! If you have experienced damage to your home from an ice dam, Aaron’s Restoration can remove the dam, repair the damage and replace walls, ceilings, plaster, drywall, moldings, etc. as necessary. You have our guarantee that your damaged area will look “like new”. 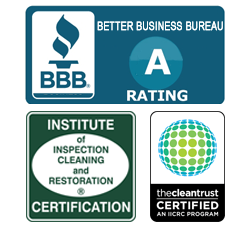 Our professional restoration team we will also make certain that any underlying or “unseen” health or environmental hazards such as bacteria or mold are completely sanitized. And we will also remove or repair the initial structural “cause” of the ice dam – to ensure that another ice dam does not occur in the same place again. Aaron’s Restoration will also work with your homeowners insurance company to help you obtain the maximum amount of coverage for your damage as allowed by your policy. Call us at 888.442.2766 to discuss your Ice Dam removal & repair needs.